As of today events along the Turkish/Syrian border region continue to slowly cool down. 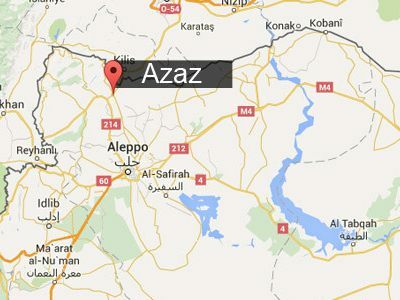 Turkey continues to shell the Kurdish positions near Azaz but with less intensity. The Saudis, like the Turks, aren't talking about imminent invasion, at least for now. The Americans and Russians too appear to have recognized the fear of being on the 'eve of destruction' as a great motivator. As the complex events continue to unfold today the best thing we can do is to look back the long history that the current conflict is a part of. What better place to start than Aleppo, where nearly 5,000 years ago a shrine was built on a hill to to a storm god, Hadda. The hill that would over 2,000 years later be fortified by the governor Alexander the Great left to rule the area after he conquered the region. The hill that today is the central prize that the Al-Nusra Front [Al-Qaeda in Syria] is holding [barely] against the combined armed forces of Syria, the Iranian militias, Hezbollah, the Syrian Kurds and the Russian Air Force. Thousands of pages have been written by historians, religionists and a wide range of scholars trying to fully explain the history of this beautiful land and peoples of the Middle East. What follows is a reading list of sorts. In it the writer of these lines will try to touch on a couple of the major events but also to suggest articles and books that look at the historic issues and events from a range of perspectives. At the time of Muhammad's birth around 570 CE the Middle East was politically and militarily divided between the The Byzantine and Persian Empires who were constantly at war and the small but fierce nomadic Arab tribes who's never ending feuds and harsh terrain had forced some of them to head north into the area between the two major Empires of the region. Later this would prove to be the region where the Arabs would first expand into and conquer both empires from because there already were Arabs there and because the two large warring empires had spent all their wealth and energy fighting each other. Muhammad was a simple man who's prophetic visions served as a catalyst to unite some of the powerful Arab's family clans around Medina and Mecca in a greater cause - Islam. The study of Early Islam is as interesting as it is confounded by those early Muslims who were contemporaries of Muhammad and who succeeded him. Almost immediately after Muhammad's death in 632 his successors launched the Arab Islamic armies in the creation of one of the world's great empires stretching from the Great Wall of China to Timbuktu, France and India. As with every empire, the internecine battles erupted not long after the conquests began. Our modern understanding of major events of that era is clouded by the different versions of those events as passed on by the various divided factions, divisions that still exist, divisions that are still playing out in Syria, Iraq, Iran, Saudi Arabia and beyond. For instance, Wikipedia's History of Islam and Desmond Stewart's Early Islam agree on the major events but differ on some of the most important details of the split between the Sunni and Shia. The Wiki version being that Husayn ibn Ali, by then Muhammad's only living grandson, died in battle in the ensuing war that transpired after he refused to swear allegiance to the Umayyads' Caliphate. Stewart's version, the one most scholars accept, says he was murdered by the Damascus centered governor Muawiyah I's followers. This is the origin Sunni/Shia division and of course both sides believe different versions. On top of that, and maybe even more important to today's events, after li ibn Abu Talib, the existing Caliph, agreed to arbitration instead of endless war with Muawiyah I for overall leadership, another group - the Khawaij later to become the Whabbists and Salafists - refused to accept any agreement because they were convinced only 'God' could choose and that the only way 'God' could be allowed to choose was to let all out war.determine who was the winner. [So these guys were fanatics from day 1]. The Kharijites developed extreme doctrines that set them apart from both mainstream Sunni and Shia Muslims. This branch of Islam founded by the Kharijites, known today as Wahhabism and/or Salafism, became the misguided expression of one man’s political ambition - Mohammed Abdel-Wahhab, a bigot who was recruited by the British Empire to erode the fabric of Islam and crack the armor of the then-Ottoman Empire by breeding sectarianism and dissent. It is Abdel-Wahhab's alliance to the House of Saud that ultimately unleashed this now seemingly unstoppable evil we know today under the tag of Islamic radicalism. Of course much has happened during the 1,400 odd years between the Sunni/Shia/Kharijite division and now that brought today's major Empires nose to nose [nuke to nuke] in the area around Aleppo. Most of those events are well researched and much less subject to conflicts of interpretation caused the existing oral tradition of communication that existed among the Arab peoples at the time. Early Islam - by Desmond Stewart - A beautiful and scholarly look at the history, religion, art and architecture of Islam that has become as controversial for it's outspoken clarity on many issues as it is praised for the beauty of its images. European Imperialism in the Middle East - a two part podcast - part 1 is about how the European powers got entangled in the Middle East - part 2 is about how WW1 and the fallout from it influenced both Europe and the Middle East. How the British divided up the Arab World - Focuses on the Sykes-Picot Agreement and post WW1 era that set the stage for our modern Middle East conundrum. Debacle of a “Great Game”: The Islamic State (IS) and America’s War on Iraq and Syria - Global Research at its best. Saudi Arabia and Israel: An Axis of Convenience - by Dan Sanchez - Brings the history up to the present. American Raj America and the Muslim World - by Eric Margolis - This book is a recent and essential overview of the last 100 years of the west's interaction with the wider Muslim world - a must read IMO. Yesterday's article by Robert Parry at Consortium News titled 'Risking Nuclear War for Al Qaeda?' brought out into the public sphere what was only a rumor until then. 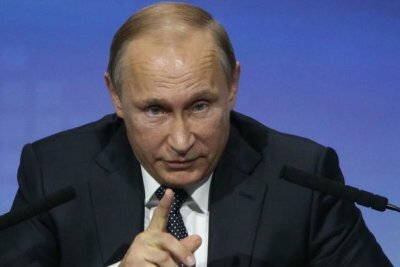 The Russians have warned Turkey that if Turkey (with hundreds of thousands of troops massed near the Syrian border) and Saudi Arabia (with its sophisticated air force) that if they follow through on threats and intervene militarily to save their rebel clients, who include Al Qaeda’s Nusra Front, from a powerful Russian-backed Syrian government offensive, then Russia is prepared to use tactical nuclear weapons if necessary to save their 20,000 or so military personnel inside Syria in the face of a Turkish-Saudi onslaught. The fear swirling among many is driven by the fact that since Turkey is a member of NATO, any such conflict could quickly escalate into a full-scale nuclear confrontation. Today Obama called Erdogen in Ankara, they talked for 1 hr. 20min. and besides offering his condolences on the recent bombings in Turkey it now appears Obama explained clearly to Erdogen that he should calm down and it made clear that the U.S. military would not join an invasion. In addition he apparently told Erdogen that Putin wasn't bluffing and that if Turkey and Saudi Arabia go ahead they will be on their own and that neither the US or NATO would back an invasion. Yesterday Parry wrote: "the only person who probably can stop a Turkish-Saudi invasion is President Obama." Adding, "The dilemma for Obama is that many traditional U.S. allies, such as Turkey, Saudi Arabia and Qatar, have been the principal backers and funders of Sunni terror groups inside Syria, including Al Qaeda’s Nusra Front and to a lesser degree, the Islamic State," Parry explains. "Now, the 'allies' [Turkey and the Saudis] want the United States to risk a nuclear confrontation with Russia to, in effect, protect Al Qaeda. Obama has answered "No", But that hasn't stopped dangerous events from continuing. Syrian rebels have brought at least 2,000 reinforcements through Turkey in the past week to bolster the fight against Kurdish-led militias north of Aleppo. The re-suppply and re-enforcement route via Turkey has become the sole supply line for Azaz, one of the last areas even nominally under the control of Syrian rebels and their Al-Nusra Front allies. The Turkish military continues it's shelling Syrian Kurds despite UN Security Council (UNSC) warning on Tuesday which urged Ankara to comply with international law. Also, Russia asked the United Nations Security Council on Friday [this morning] to call for Syria's sovereignty to be respected, for cross-border shellings and incursions to be halted and for "attempts or plans for foreign ground intervention" to be abandoned. Also today Turkish military vehicles have crossed into a Kurdistani area in Syria, Afrin, just over the border, a Kurdish news agency reported adding that the troops started digging a trench between the towns of Sorka and Meydan Ekbis. According to the agency the construction of a concrete wall on the Syrian border in the area is ongoing as well. IMO. we are is closer to nuclear war than at any point since the Cuban missile crisis. Russia is steadfast and has international law on its side. Turkey is run by an insane group who is out of control, the Saudis and their fanatical ilk, the Wahhabis and Salafis embrace the doctrine of Takfir; they consider Shia and other non-Sunnis to be apostates (non-Muslims), and therefore frequently worthy of divinely sanctioned slaughter. Indeed Obama and thankfully Putin are being adults. After today's 'talk' with Erdogen by Obama and yesterday's warning from Putin i suspect and hope that over the next few days the Turks will slowly climb back from the cliff and the adults will be able to use this near miss as a stepping stone at least, or better yet, a revelation that they are both caught up in a drama of immense proportions that is fueled by religious fanaticism. Turkish tanks at the ready to invade Syria. Will They Go? The blast last night that hit a military bus in Turkish capital Ankara and the nearly immediate blame the Turkish govt. hurled at the Kurds, long before they could have carried out any type of investigation into who was responsible, has raised the suspicions of a long time Turkey watchers and skeptical media coverage. The ZeroHedge article titled 'Are the Latest Turkish Attacks False Flags? provides an interesting list of Turkey's history of false flag operations and includes corroboration by Turkish govt. sources. Turkey is at war with the Kurds not ISIS not Al-Nusra. Turkey immediately vows response in Syria and Iraq. Then, within hours, Turkish warplanes bombed bases in northern Iraq of the Kurdistan Workers Party (PKK), which has waged a three-decade insurgency against the Turkish state and which Davutoglu accused of collaborating in the car bombing. Of course nobody knows yet, or maybe ever, just like the hospitals bombed in Syria a few days ago, who did the bombings but the Russians and Syrians strongly deny they had anything to do with the hospital bombings and all the Kurdish groups inside and outside of Turkey deny they had anything to do with the blast in Ankara and have no idea of who did it [though the Kurds all suspect ISIS as the most probable culprit]. Whoever did the Ankara bombing it's timing sure was convenient for Turkey who has been condemned by the US, France and the EU for shelling the Syrian Kurds this week and who has threatened to invade northern Syria to protect its last good overland routes, routes it uses to re-supply and re-enforce it's ISIS and Al-Nusra allies there as well as the the routes that run between the Syrian oil fields and Turkey's refineries. The Kurds at the same time also warned Turkey of a ‘big war’ with Russia if Turkey invades Syria. Saying "Russia has promised to protect Kurdish fighters in Syria in case of a ground offensive by Turkey, a move that would lead to a "big war." Adding "We take this threat [of an invasion of N. Syria] very seriously because the ruling party in Turkey is a party of war," Rodi Osman, head of the Syrian Kurds' newly-opened representative office said in Kurdish via a Russian interpreter. "Russia will respond if there is an invasion. This isn't only about the Kurds, they will defend the territorial sovereignty of Syria." Russia itself said it is helping the Syrian Kurds militarily and Nikolai Kovalyov, a former head of the Federal Security Service, the main successor to the Soviet KGB, said that Russian jets would bomb Turkish troops if they enter Syria. 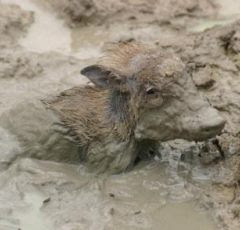 Everyday the situation looks more dire. Turkey and Saudi Arabia look set to invade but only with Washington's approval and participation. Without the US it's an empty threat because the combined Russian, Syrian, Iranian militias and Hezbollah would demolish them. In fact Turkey won't even fly across the border to bomb the Azaz area because the Russian anti-aircraft misslies would blow them out of the sky. So for now, it's artillery fire, bombastic rhetoric, and the attempt to get the US to back their play. Turkey wants a ‘secure line’ created 10km inside Syria, including Azaz and has issued an ultimatum to the US saying the US has to choose whether it wants to back Turkey or the Syrian Kurds. Turkey will use the bombing in Ankara as their justification and the Saudis will too. Both of them will try to get NATO and the US to follow by saying they, Turkey - a NATO member, and the Saudis - an American ally, are under attack. The next move seems up to the US who've repeatedly said they won't send in ground troops and that the Kurds in Syria and Iraq are the only truly effective anti-ISIS and Al-Nusra forces. What Turkey and the Saudis are forgetting is that by doing nothing the US can allow Russia to be their firewall. Turkey and the Saudis are surrounded by enemies - Russia, Syria, Iran, Hezbollah, the Shia Iraqis and the Kurds [who are by and large secular and neutral in the Sunni/Shia confrontation though they detest Whabbism]. Will Turkey and the Saudis go into Syria without the US...no way...it's all a bluff designed to get the US and NATO to support them. Turkey shelled Kurdish positions for a third day today to try to stop its fighters from seizing Azaz, just 8 km (5 miles) from the border. Ankara fears the Kurdish militia, backed by Russia, is trying to secure the last stretch of around 100 km (60 miles) along the Syrian border not already under its control. As Turkey continues its bombardment of the Kurdish positions around Azaz and Aleppo it's important to look into why they are doing it despite protests from Washington, Paris, NATO, Russia, Syria and, of course, the Kurds themselves. Basically Turkey sees their last easily accessed southern border crossing into Syria, the last roads capable of handling the oil tanker trucks that roll between the captured Syrian oil fields and the Turkish refineries, the last road crossings through which they can resupply and re-enforce with jihadi and mercenary warriors of Jabhat Al-Nusra, Islamic State and other terrorist groups’ units who suffered casualties in the battles throughout Syria. As Abayomi Azikiwe, editor of the Pan-African News Wire, says "So we already have considerable evidence that Turkey is assisting Islamic State and other terrorist organizations to put pressure on the government of President Bashar al-Assad. At the same time, with previous allegations that Saudi Arabia is one of the main financiers and logistical supporters to IS and other terrorist organizations, this clearly shows that they feel very threatened by recent developments in Syria, as far as the Syrian Army is concerned, as well as the air campaign from the Russian Federation." As the west twiddles its thumbs and issues empty admonishments from Washington to Brussels to Berlin, sound minds are terrified that the EU and NATO are now actually hostage to Erdogan’s Kurd “priority”, while Ankara is doing next to nothing to fight massive migrant smuggling. When Davutoglu went to Berlin recently not only did he make no promises, he re-stressed Erdogan’s vow to "annihilate" the Syrian Kurds. The treacherous agreement that is one of the leading contenders for 1st place in the 'how the hell did we get here' award is called the Sykes-Picot Agreement. 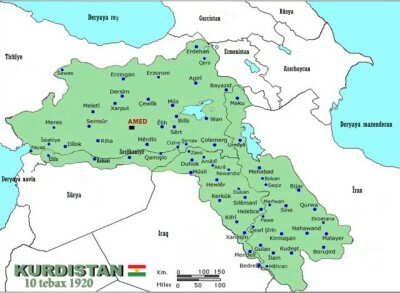 At first during its secret negotiations between the UK, France, Ireland and Russia, Kurdistan continued exist, but because of the leverage of various players - including the surrender of the Ottoman Empire - Kurdisatn disappeared from the maps... but not from the hearts and minds of the Kurds. 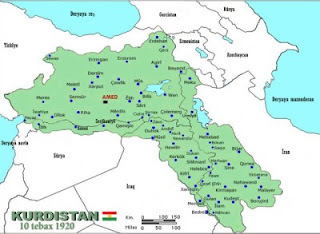 Many Kurds never recognized the Sykes-Picot Agreement's elimination of their homeland and fought both politically and through various insurgencies both within Turkey and throughout the re-drawn region. The 1970s saw an evolution in Kurdish nationalism as Marxist political thought influenced a new generation of Kurdish nationalists opposed to the local feudal authorities who had been a traditional source of opposition to authority, in Turkey and beyond, eventually they would form the militant separatist PKK within Turkey. Turkey's military allies the US, the EU, and NATO see the PKK as a terrorist organization while the UN, Switzerland, Russia, China and India have refused to add the PKK to their terrorist list. Some of them have even supported the PKK. From 1984 to 1999, the PKK and the Turkish military engaged in open war, and much of the countryside in the southeast of Turkey was depopulated. An estimated 3,000 Kurdish villages in Turkey were virtually wiped off the map, representing the displacement of more than 378,000 people. Nelson Mandela refused to accept the Atatürk Peace Award in 1992 because of the oppression of the Kurds. The Kurds living within Syria, Iraq and Iran formed their own political and military groups. The YPG who Turkey is now shelling are the Syrian Kurds who are broadly acknowledged to be the most effective group in the fight against ISIS and Al-Nusra. The Turkish leaders lust for their lost empire but know that dream will never happen if the Kurds take total control of the Syrian side of the Turkey/Syria border. So as each day passes Turkey's pronouncements sound a bit more shrill. Today it's : "Turkey ‘won’t let’ Azaz, Syria, fall to Kurdish militia", tomorrow who knows, but if they and the Saudis do invade Syria as they threaten, it'll be not just another episode in the Long War in the Middle East, this time it's also part of the potential nose to nose confrontation between the world's most heavily armed nations - Russia and the US. Two very important and dangerous stories arose in this morning's breaking news out of Syria in every mainstream media outlet around the world not under the thumb of the US empire and its vassal states. First, the Turkish military overnight began shelling Kurdish targets along the feeder routes into Aleppo in northern Syria. The positions that the Turks are shelling should be of special interest to Canadians because these positions are being held by the same Kurdish peshmerga fighters that Canadian Special Forces trainers are embedded on the ground with. 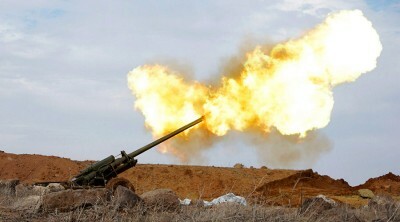 Consequently the Canadians are today under fire in and around Azaz along with the Kurds they are there to train. 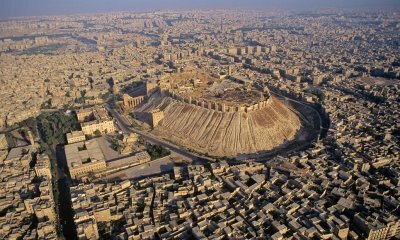 Aleppo, Syria's largest city, is held by the Al Qaeda affililiated Al-Nusra Front but is nearly surrounded by Syrian troops and Hezbollah fighters supported by Russia's air bombardment. Azaz sits at an important junction in the road network between the Turkish border and Aleppo. Why would Turkey, a NATO member and supposed ally of the US and Canada in their fight against ISIS, be shelling the Kurds who are the only forces on the ground with the cajones to actually fight ISIS and/or Al-Nusra? The answer, like the whole war in Syria is confusing, complicated and purposely made misleading by the western power's propaganda campaigns...including Canada. The second story says that Saudi Arabian jets are in the process of moving into the Turkish airbase that the US uses near the Syrian and Iraq borders. The Saudis, like the Turks claim to be allies of Canada and the US but in reality have their own agenda. Turkey, as an independent Norwegian report concluded: "Exports happen in a well-established black market via Turkey...Many of the smugglers and corrupt border guards, who helped Saddam Hussein avoid international sanctions, are now helping ISIS export oil and import cash." Even Israeli defense minister said a few days ago that ISIS funded with ‘Turkish money’. 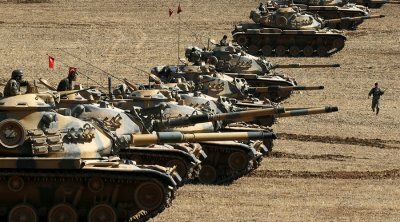 The reality is that Turkey's autocratic ruler Erdogan’s Kurd priority is driving this frenzy of preparations by Turkey to invade Syria and "annihilate" the Syrian Kurds. The Saudis, a top level US vassal state - who the Canadians are set to fulfill the largest weapon sales deal in their history with - along with their Gulf state sub-vassals are also threatening to invade Syria. If Turkey and Saudi Arabia invade Syria, they’ll be supporting ISIS and other terrorist groups against Assad – complicit with Washington, wanting Western-controlled puppet governance replacing Syrian sovereign independence. 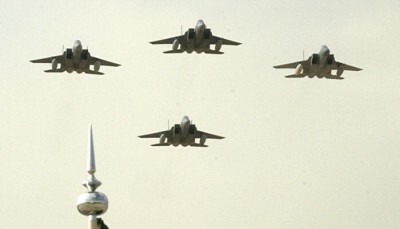 Syria too has powerful allies - Iran, Russia, Hezbollah and China. The invasion of Syria by the Turks and Saudis could ignite World War III. Canada has put itself right in the middle of the situation. At the same time Canada is training the Kurds, who the US also supports, while the Turks unequivocally call the Kurds terrorists. At the same time that Canada is arming the Sunni fundamentalist Saudis they are committing to being on the front lines assisting the Shia Kurds. The Saudis, whose Wahhabist ideology is the root cause of terrorism, are at war with the Shia. The Canadians on the ground in Syraq have been put in a very dangerous situation by the Canadian government's inability to tell the rest of us Canadians the truth...the U.S. is prepared for military solution against Islamic State in Syria. This global war will be initiated by the vassals in the name of ousting Assad in Syria but its real aim is to use the Sunni/Shia divide as a wedge to enhance America's military position and to tighten its grip on the world's finances through its petrodollar hegemony. If there is a good guy in this, it's the Kurds. By intelligent maneuver, blind luck or a bit of both, Canada has found itself both smack dab in the middle of what could easily turn into the Armageddon uber-right wing evangelicals see as their Rapture defining stairway to an eternity with their imaginary god. Lucky Canada eh! 'Rainy days' have arrived in Alberta. These are the kind of days that former Premier Peter Lougheed, who served as Premier of Alberta from 1971 to 1985, setup the Heritage Savings Trust Fund [also know as the Alberta Heritage Fund ] back in 1976 to prepare for. 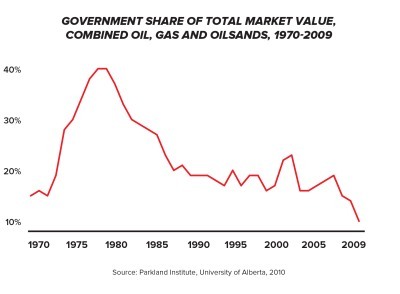 As Andrew Nikiforuk wrote yesterday: "Had Alberta maintained a 30 per cent royalty rate on the share of the value of the oil and gas produced between 1971 to 2014, Albertans would have generated $471.4 billion in oil and gas royalties. Instead, for 35 years, the former Tory government of Alberta consistently lowered royalty rates to among the lowest in the world. At the same time it saved almost nothing for future generations. As Better Way Alberta explains: "Alberta now collects far less than other oil-producing jurisdictions, like Alaska, Texas and Norway…and less than other heavy-oil producing jurisdictions like Mexico, Venezuela and Angola. Instead of saving royalty revenue in the Heritage Fund, the government spent almost all of it on day-to-day operational expenditures. This gave the illusion of stability and allowed the government to provide middle-of-the-road services that their shrunken tax base would not otherwise allow them to afford. Now it's raining and Alberta is moaning. They must have forgotten that for decades they boasted about the Alberta Advantage - no sales tax, low gasoline taxes, a flat income tax, low corporate income taxes, royalties that have plummeted from a 40 per cent high during the Peter Lougheed years to less than four per cent today and occasionally even a 'prosperity bonus' - to entice businesses and families to move to Alberta. Thousands of our sons and daughters believed in this free lunch delusion and left for the 'easy money' in Alberta, it'll be good to see them more often after their return. Now it's raining Albertan crocodile tears. Alberta, along with their conservative residents and their Conservative politicians now are demanding help, not only from their residents who enjoyed the low-tax advantages all these decades, but also from the rest of us who had to endure listening to how Alberta, by spending it's natural capital instead of saving some as Lougheed did, was populated by some sort of economic geniuses. Instead Alberta's advantage was simply a combination of being lucky to be living on top of an ancient tar sands deposit and short sighted enough to believe the good times provided by the bitumen bubble would just keep rolling on. In response to Alberta's whining about this mess they themselves created their new NDP Premier Notley [who's party spent decades of opposing the endless royalty cuts] chose a bunch of bankers and industry 'experts' to produce a review of royalty rates which critics are slamming as a policy disaster. They, of course recommended a policy, that if adopted, would lower Alberta's royalties by another billion dollars a year, estimated Jim Roy, an Edmonton-based royalty consultant and a former senior adviser on royalty policy for Alberta Energy. Barry Rodgers, a former high-ranking Alberta civil servant in the Department of Energy and a fiscal systems expert, noted the review barely mentions that the former Tory government consistently failed to save revenue (except under Lougheed), collect its fair share as mandated by the government policy, or report to citizens in a transparent and open manner on royalty issues. "Alberta's royalty policy", said Rodgers, "is not consistent with the fundamental resource and environmental management notion of "In-Trust." That notion, long abandoned by the Tory party, reflects the principle "that current generations have a moral obligation to not leave future generations worse off." So, now in response P.M. Trudeau is promising to expedite Alberta's share of the infrastructure investments that his Liberal govt. is planning but, to his credit, has refused to fast-track the pipelines that the oil industry is trying to pressure him into, saying that he blames Conservatives for 'politicized' NEB process and won't rush Energy East. Were Trudeau and Notley to themselves adopt the 'In-Trust' paradigm they'd concentrate on diversifying Alberta's economy, on mandating that oil and gas royalties and taxes are befitting what the owners of a resource should be getting and putting a Lougheed sized share of that In-Trust'. They'd mandate a 180 degree turnaround on prairie grassland restoration to save their soils from the same fate their oil and gas resources are facing now and they'd cut back to near elimination the tar sands and fracking industries until such a time in the future when some methodology has been invented that will allow these energies to be used without damaging our shared environment. Then use them to power Canadian industries that employ Canadian people not export them as raw resources. 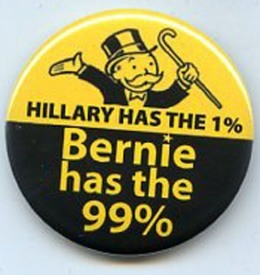 Hillary has the 1%, Bernie has the 99% [whoever invented this simple, revolutionary meme is a genius]. Why? 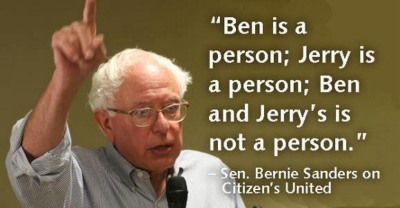 Bernie isn't polished or pretty, but, he's speaking the truth and the 1% fears him. While much of Bernie's success has been attributed to his strong support among young voters [according to CNN's entrance poll, Sanders beat Clinton among Iowa voters age 18 to 29 by 70 points], Salon's David Dayen pointed yesterday that to the "large contingent of progressives, with a perspective typically excluded from the traditional media who, by-and-large, are against war, big banks, and corporate-controlled politics, and in favor of Social Security, equal rights, and government regulations, saying: "If Sanders wasn’t the standard-bearer for [these ideals], it would have been someone else. Because we’re seeing an actual debate over not means but ends." Tonight's town hall meeting in New Hampshire between Bernie and Hillary on CNN could be a barn burner. Sanders leads Clinton by 33 points among registered Democrats in the University of Massachusetts-Lowell/7 News survey released today. He takes 63 percent in the Granite State, contrasted with 30 percent for Clinton in results unchanged from the pollsters' previous survey. i expect to see Hillary attack Bernie's aspirational ideas as impossible to accomplish. i expect Bernie to counter that his overwhelming support among both young and independent supporters is exactly the recipe for the large scale change in the makeup of Congress that progressive Americans yearn for. Next stop on the rolling revolution tour after New Hampshire is Nevada where the poll numbers are changing fast as Latinos turn away from Hillary after her 'Hispandering' ads created a huge backlash on social media. Twitter users can check out #NotMyAbuela (or #NotMiAbuela) to follow the action. Meanwhile Hillary's lead nationally has shrunk from 20 points Jan 1st to just 7 points now.